So the army all together. the colours all tie together and gives it a strong vibrant look. I’ve been asked to add to this force but that’ll be later on in the year. The Canoness was one of my favorites to paint, Ill have to get one for myself to add to the pile lol. Also included a picture of the limited edition Necromunda Bounty Hunter and Inquisitor that have conscripted this Sisters of Battle force into helping them. Next up the core units. Simple and easily painted but they do still look good on the custom bases. Just hope that the seraphims don’t fall over to much lol The Repentia Squad, with there reversed scheme fit in nicely while still being different. The Penitent Engine, once again a simple main colour scheme but the details really make it come together and make a good mini. It is basically silver with blobs of red and white. Finally, the Living Saint, Celestine herself. I enjoyed painting this mini, mainly because I thought the wings would be trouble. Turned out but keep it simple and finding a scheme to copy it went smoothly. Well, that all for the sisters for now, and its on to Wood Elves and Chaos Dwarfs next for me! 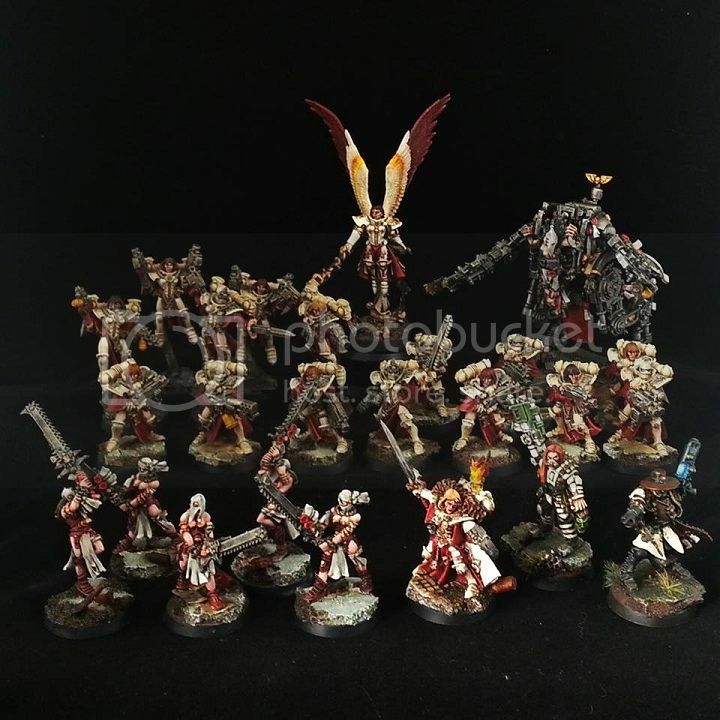 This entry was posted in Painting Tips, Painting to Improve, Warhammer 40k and tagged 40k, Army blog, Battle Sisters, Imperial, Imperial army, inquisitor, sisters, Sisters of Battle, Sisters of the Pure Morning, T4g, tale of four geeks, vidpui, warhammer, Warhammer 40K, wh40k. Bookmark the permalink.